Conveniently store up to 30' of your 30 or 50 Amp power cord in the new REEL56-009H Economy Easy Reel Spooler by MORryde. The reel features a unique design which allows heavy power cords to be stored strain free. You will be able to quietly and quickly dispense your cord with ease. 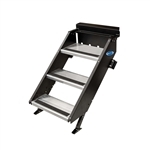 MORryde CTG60-2090W Sliding Cargo Tray - 20" x 90" MORryde STP-3-27-05H StepAbove 3-Step RV Entry Steps - 26" to 28" Door Width MORryde CTG60-2960W Sliding Cargo Tray - 29" x 60" MORryde CTG60-2048W Sliding Cargo Tray - 20" x 48"
MORryde CTG60-4290W Sliding Cargo Tray - 42" x 90" MORryde CTG60-4272W Sliding Cargo Tray - 42" x 72"